Original melodies, generous harmonies, and carefully crafted lyrics. - The #2 album on the Folk charts for February 2015 with two songs tied at #5! 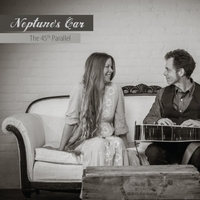 The 45th Parallel, the third album by Contemporary Folk duo Neptune's Car, takes the listener on a journey across the northern states of America. From a copper mine in the White Mountains of New Hampshire to the Elk Capital of Michigan to the Big Sky Country of Montana, this collection of songs chronicles the experiences of the people who populate these small, northern towns. With warm vocal harmonies, acoustic guitar-driven arrangements, and poetic imagery, The 45th Parallel is full of richly, detailed story songs. Holly Hanson and Steve Hayes introduce nine new, original songs and one carefully chosen cover, By the Time It Gets Dark by Sandy Denny. The album opens with the big, acoustic guitar-strummed chords of A Blue Sky Turned to Rust — a song inspired by a New England ghost story. The title track, The 45th Parallel, is one of two songs about Michigan on the album. The song takes the listener to the quirky, small town of Atlanta, the Elk Capital of Michigan, that sits on the 45th parallel — the line of latitude that marks the halfway point between the Equator and the North Pole. The 45th parallel marker is also mentioned in the opening lines of Ann Arbor to Up North Atlanta, a rousing banjo number with lively harmonies. Hayes contributes three original songs to this album with the banjo-inflected Backcountry and the stripped-down acoustic guitar, story songs River Street and The Storm. The album closes with the hopeful song By the Time It Gets Dark, written by British Folk rock singer and songwriter Sandy Denny (Fairport Convention). The 45th Parallel was recorded in four days by Mark Thayer (Chris Smither, Peter Mulvey) at Signature Sounds Studio in Pomfret Center, Connecticut. Sven Larson accompanies Hanson and Hayes on upright bass. Neptune's Car (Holly Hanson and Steve Hayes) is a nationally touring, acoustic duo from Massachusetts and New Hampshire who play original, Contemporary Folk music. The duo has shared stages with Folk legends Archie Fisher, Bill Staines, David Mallett, and more. As fresh and melodious as ever, Neptune's Car has graced the New Year with their third album of contemporary folk songs. Holly Hanson and Steve Hayes combine their considerable talents to provide ten new musical portraits of people and places along "The 45th Parallel," that magical circle of latitude that is halfway between the Equator and North Pole. After hearing the album for the first time today, my wife exclaimed "That is one you want to hear again and again." Simply beautiful. Nothing more need be said.